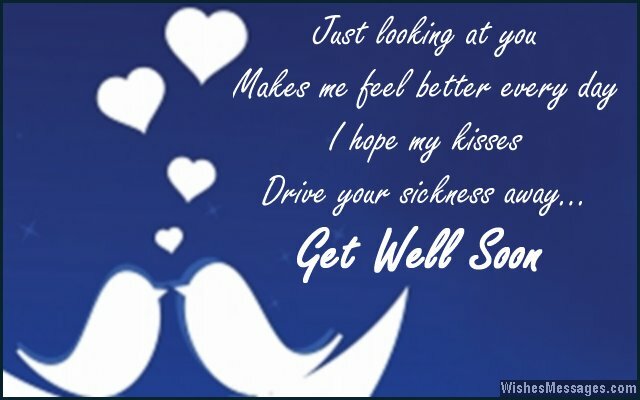 Get well soon messages for girlfriend: Write a sweet note and cheer your girl up when she is sick. Send her flowers, post cute stuff on her Facebook, tag her in funny tweets and send her mushy texts that will make her feel better. Shower her with affection, hugs and kisses because love is a better healer than most medicines. Whether she is in the hospital for some major illness or recovering from a bad cold at home, make sure that you live up to the image of the boyfriend who really cares. A greeting card with a romantic doodle along with some flowers will make her feel like the luckiest girlfriend in the whole world. 1) I think by the time you feel hale and hearty, I will fall ill for missing you like crazy. I think by the time you start smiling again, seeing your suffering will make me wither in pain. 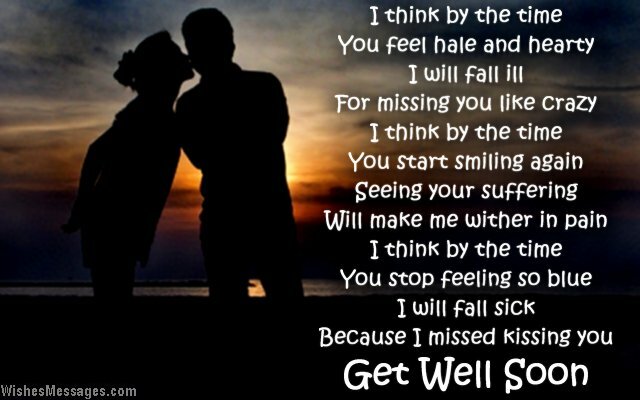 I think by the time you stop feeling so blue, I will fall sick because I missed kissing you. Get well soon. 2) I need your kisses more than you need your medicines. I need you more than you need your doctor. I love you, get well soon. 3) Only I am allowed to give you a flushed face, not your flu. Get well soon baby. 4) I am sad that my SWEETheart has to take BITTER pills. I am glum because my BEAUTIFUL princess has got an UGLY infection. I am devastated that my HOT girlfriend has caught a COLD. Get well soon. 5) I request you to spare the bacteria and stop attracting them to your beautiful body. Get well soon. 6) If kisses were a drug, hugs were a medicine and cuddles were a home remedy, believe me baby I would be nursing you 24×7. Get well soon. 7) My love for you is stronger than any germ in this world. Get well soon baby. 8) My hand misses your hand, shoulders miss your head, arm misses your waist and mouth misses your lips. Get well soon baby. 9) Your sickness is affecting my happiness. Your condition is causing me frustration. Your ailment is affecting my enjoyment. Not being able to kiss you is causing me desperation. Get well soon baby. 10) The flower of my life is withering without the sunshine of your face. Get well soon. 11) If I were a genie, I would make a magic potion to beat your illness. But since I am only your boyfriend, I am just going to cure you with smiles, laughs and happiness. 12) I am coming to meet you, so say goodbye to tablets, capsules and balms. You will be well as I make you feel better with my never ending charms. Get well soon. 13) First, your mom wanted you to stay away from me. Now she’s got an alibi in your germs. Get well soon. 14) I know I’ve been telling you how HOT you are all the time. But you didn’t need to take that literally and heat up with a fever. Get well soon. 15) I know you like my pampering a lot, but this isn’t the right way of asking for more. Get well soon baby, I promise to pamper you even when you are not sore. 16) I don’t know if I am the perfect boyfriend but there is one thing that I do know – I will hold you tight, give you warm hugs, cuddle with you and kiss you until you feel better. I love you, get well soon. 17) Whether the battle of your life is big or small, I promise to be with you though it all. Get well soon baby. 18) A white flower for good immunity, pink flower for happiness, red flower for love and a lavender flower for strength – my perfect floral picks for my beautiful sweetheart. Get well soon. 19) Your place is not in the hospital, it is in my heart. Your company isn’t meant for nurses, it is for my soul. You don’t deserve strong doses of medicine, you deserve my love. Get well soon. 20) I am jealous of your flu. That’s because it gets to spend all day with you. Get well soon. 21) Without you, Facebook seems boring, Twitter has become dull and Instagram is dreary – but none of them are as lonesome as my heart. Get well soon. 22) Even when pale, you look hot. Even when weak, you look bubbly. Even when tired, you look cool. Even when frail, you look lovely. Get well soon. 23) I feel like giving you a kiss even though I know I will catch an infection myself. That is how desperate I am to have you in my arms. Get well soon. 24) Your postoperative care includes lots of hot dates, amazing gifts and night outs with your handsome boyfriend. I hope now you feel better. 25) Going anywhere without you is like going to watch a 3D movie without the glasses – no fun. Get well soon. 26) If this illness is your way of making me realize your importance in my life, then your job is done. Get well soon, I really miss you. 27) A box of chocolates, pack of candies, carton of muffins and a string of kisses. This is what I have got for you, now I hope you stop feeling blue. Get well soon. 28) Whether it is a royal blue satin gown or ordinary blue hospital pajamas – you look pretty as always. Get well soon. 29) Smack em’, slap em’, beat ’em, strike ’em, sock ’em, belt ’em, whack ’em, pulp ’em – that is what I want to do to the germs in your body right now. Get well soon. 30) Your hospitalization is God’s way of giving you plenty of time to think about what a cool boyfriend I am. Get well soon. 31) Just looking at you makes me feel better every day. I hope my kisses drive your sickness away. Get well soon. 32) Your parents miss having you at home. Your friends miss having you at college. But I miss having you around me everywhere I go. Get well soon darling. 33) There is pain in your body, but it is my heart which is palpitating. There is fever in your body, but it is me who is sweating. There is discomfort in your sleep, but it is my body which twists and turns every night. Get well soon so that I can get well soon too. 34) I would have pampered you anyway. I would have spoiled you anyway. I would have indulged you anyway. You didn’t need to fall sick for that. Get well soon. 35) I want you to close your eyes and think about the first time we kissed. I hope you feel better. Get well soon.